MineExcellence presents a mobile and web based drilling analysis platform to collect, analyse and optimise drilling and blasting parameters. The system has been designed to determine the physical and geological rock characteristics of the underlying strata. The data collected in the system is used to obtain qualitative physical assessment of strata and chemical analysis of drill cuttings. 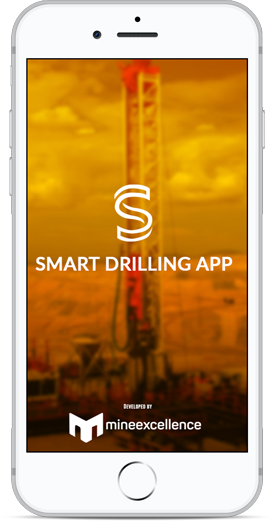 The information captured in the drill log allows for auto generation of drilling pattern report for on-site availability to drillers and blasters and also a drill performance report to measure and analyse the difference between actual and planned drill. Empirical formulas are applied on the recorded data to predict the behaviour of strata in terms of rock characteristics and mineral quality. The users can avail advanced analytics related to drill logs based on drill penetration rate, drill deviation, time factor for different layers of strata and cost consumption. It also captures idle time of drill and worker, records frequency of drill downtime. The users can predict the drill bit breakdown and allows planned maintenance based on information from the measurable drilling parameters like pressure, penetration rate, fuel consumption, etc. Ability to add, view and edit a drill pattern. Ability to update real time drill logs to an existing pattern and differentiate between drilled vs planned holes. Ability to add, move, remove, rename a hole dynamically in the pattern. Ability to edit a hole and update the different strata and loading information at different depths. Ability to view a hole depth diagram with ability to add different layers of materials. Ability to export drill logs as .csv or .pdf files. Ability to visually differentiate the holes based on their drill statuses – planned, completed or in-progress holes in the designed drill pattern.